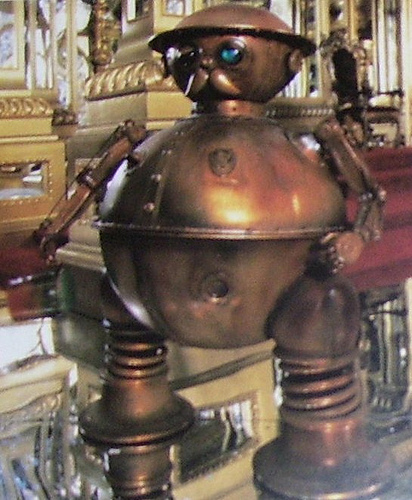 Clockwork automatons, the Steampunk precursors to robots, are a core part of the subgenre but rarely come off as particularly creepy. How could something like the loveable Tik Tok be scary? Sure. That's what I thought, too, until I stumbled upon an actual 1870s carte de visite photograph of a steam-powered clockwork man wearing a top hat and no pants. Ready to meet tonight's nightmare? 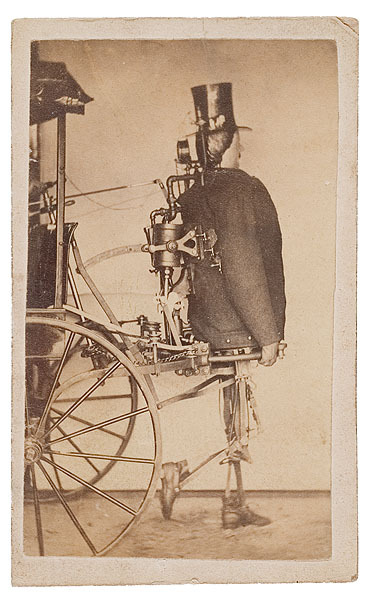 According to the Cowan auction house, the image is most likely documenting the automaton for a patent application. The steam engine that powered the machine was placed on a cart behind it making it fully mobile. The articulated robot with a human visage and all-too-real looking hands was most likely photographed without pants to illustrate the leg design. The carte de visite was sold in 2007 for a meager $690.00. I don't know about you, but I think this real-life steampunk horror is priceless. That pants-less creepy thing is nowhere near as loveable as Tik Tok!